Current Status: CLOSED! Thank you to everyone to applied! So NYCC is coming up in a month and what a better way to celebrate that than to open up photoshoots, eh, eh?! Starting now, I will be making a few minor changes to the way things work. Have a look at the refreshed list here. Your preferred Photoshoot location should be at or somewhat near the convention area on the map provided in each post (unless you're willing to pay for the cab to an exotic location). You will receive 7 photos at minimum, with each additional person 4-5 extra to the overall number including group shots, each photos is at 2K resolution. If you are satisfied with your photos and would like a 4K set afterwards, I may be willing to sell those for an additional $10. It's a flat fee for a set of any size. This is ideal if you want to print a HQ print for your wall. Upon meeting-up, have a location in mind where you want to shoot; I can offer suggestions but I prefer you to be the judge of where you'd like to shoot. Bring a multitude of poses for me to capture! Similar note, try and keep the shoot to 1-2 nearby spots, I don't want to go on long walks to multiple locations, this would also cut into your shoot time! 5-10 minutes I'm ok with, but if you're half hour late, some of that time will be unfortunately taken out of the shooting time as I need to keep my schedule in order. If you feel the need to cancel, contact me first we'll see if we can work something out. When you receive your photos, PLEASE, DO NOT crop the photos to change orientation, make heavy modifications, remove watermark, or add cartoony effects. You may also make *minor* additional changes to the photos with the intent of enhancing the photo. You may feel that a certain image looks a bit too dark or too bright sometimes, but understand this is the way I edited the photo, please don't try to "brighten" darker images. No matter how much you work on an image, someone else can always take the image and improve even more upon it. I just need to get that out in the open so we can all be on the same page of what's expected of each of us, I don't like miscommunication! :' D Please also refer to this page for a few more details on ownership. So if you're all set and would like to schedule something, refer to the map and times below here. Send me your top 3 picks for times along with the preffered meet-up location. 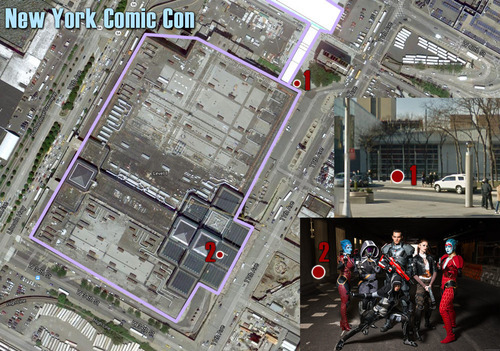 So spot 1 is around the location from the main entrance, easy to spot. The 2nd spot is in the "tunnel", there's an entrance near the pillars, you'll find your way around. Remember, these are just the meet-up spots, its to make finding each other simpler. Where we go from there, is choice I leave to you. So with all the information set forth, shoot me an email having filled-out the following info, include "NYCC 2013" somewhere in the title. Remember, give me you top three picks for time, I like to try and fit to everyone's schedule. Depending on demand and what my schedule looks like I may decide to open additional slots. I will be looking at quality as a determining factor as well.